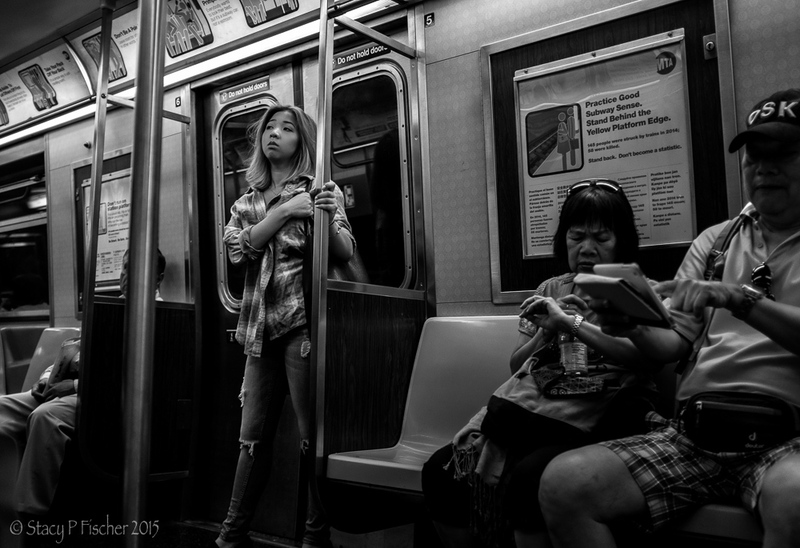 This entry was posted in Black & White, Monochromia, New York City, Places, Street Photography and tagged black and white, Fuji X100T, New York City, photography, postaday, street photography, subway. Bookmark the permalink. That girl really is striking. She looks so thoughtful, you wonder what her story is. Wonderful shot! I do hope hers is a “good” story, Claire. Thanks so much! Glad you did…She is still the immediate focus, but then as the eye wanders, you get the full scene…making for a better image. Wonderful picture. I like the contrast too – her in the light and the seated passengers in the darkened shadows. It brings out her wistfulness even more. Then you “got” what I was hoping for 🙂 Thanks!! Oh wow talk about the right moment at the right time. This turned out fantastic. Wonderful image Stacy – one of those ‘thousand word’ moments ! Thanks very much, Jane. I do hope the thoughts she was lost in were good ones. Great capture. The young woman looks in a world of her own. Any fantasy I ever had about you and me being pretty much on a par in talent has been effectively quashed the past few months. I hate you!